Mikey Weinstein of the Military Religious Freedom Foundation (MRFF) posted an op-ed on the Daily Kos website following the high court ruling, entitled “MRFF Demands Ouster of All Homophobic Military Chaplains.” Weinstein noted that the crux of this organization is “fighting the scourge of fundamentalist Christian extremism” and spoke about this goal in light of the Supreme Court decision. 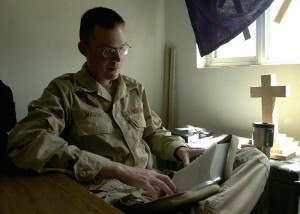 “What truly troubles these cretinous sentinels of vile prejudice and hate-mongering bigotry is the fact that this ruling will go down historically as the watershed moment which may indeed shatter the spine of the Religious Right in the U.S. military, whose prior viselike grip over the chaplaincy has formed the key obstacle to social progress within the Armed Forces,” Weinstein continued. He then stated that Christian chaplains who oppose homosexuality should leave the military or be forced out. As previously reported, in 2013, Weinstein had asked Department of Defense officials to punish superiors who attempted to proselytize their subordinates. He also appeared before Congress last November, where he was questions by Rep. Randy Forbes, R-Va., about his hostility toward Christianity. “I haven’t heard any people of faith calling atheists ‘monsters’ or saying they want to put sucking wounds in them,” Forbes later remarked. Brig. Gen. Doug Lee, chairman of the executive committee for the Chaplain Alliance for Religious Liberty, told reporters that Weinstein’s latest comments drip with hatred toward Christian chaplains.